Dr. Hernandez-Reyes’s main principles at Union City Dental Associates are professionalism and honesty. He puts forward his best effort and knowledge to provide healthcare that has a positive impact for every patient he sees. Dr. Hernandez-Reyes graduated from dental school in Cuba in 2001. He practiced in Cuba as a general dentist, then moved to Venezuela and practiced there from 2004 to 2006. In 2006, he moved to the U.S. and worked as a dental assistant until 2012, at which point he enrolled at the New York University College of Dentistry. In 2015, Dr. Hernandez-Reyes graduated with his Doctorate of Dental Surgery from NYUCD. A large part of Dr. Hernandez-Reyes’s commitment to his patients, and his profession, is to attend regular courses of continuing dental education. Each year he completes many classes, attends conferences, lectures, and seminars, and keeps current on research through dental journals. This ensures that he provides the most advanced dental care, using state-of-the-art technology and methodologies, for the best treatment experience and results. 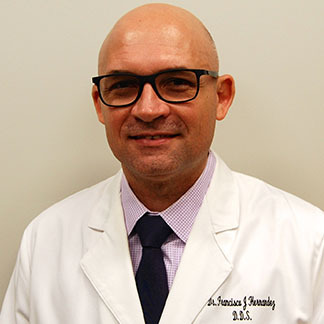 Born and raised in Placetas, Cuba, Dr. Hernandez-Reyes has lived in northern New Jersey, in the West New York/North Bergen area, for more than a decade. Outside the office, he enjoys spending time with family and friends. He’s an avid traveler, values being in contact with nature and wildlife, and is a photographer as well. Dr. Hernandez-Reyes is also very interested in ornithology, particularly canaries. He also likes music and collects vinyl records.